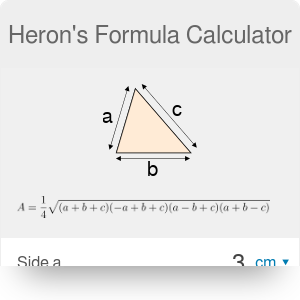 If you are wondering how to calculate the area of a triangle knowing its three sides, you're at a right place - this Heron's formula calculator can do it in no time. Simply type in your given values - e.g. triangle sides - and our tool will show you the answer. If you are curious about Heron's area formula, you will read about it below. Also, the Heron's formula proofs may be found there, so keep scrolling to find out more about this useful, but not so well-known, formula. Trigonometry and the law of cosines. Other proofs also exist, but they are more complex or they use the laws which are not so popular (such as e.g. a trigonometric proof using the law of cotangents). All the values in the formula should be expressed in terms of the triangle sides: c is a side so it meets the condition, but we don't know much about our height. So to derive the Heron's formula proof we need to find the h in terms of the sides. Here you are! That's the Heron's area proof. Changing the final equation into the form using semiperimeter is a trivial task. Great! Now you understand why this formula is valid, so don't wait any longer and give the Heron's formula calculator a try! Heron's Formula Calculator can be embedded on your website to enrich the content you wrote and make it easier for your visitors to understand your message.